In Indonesia, extractive industries like bauxite mining or palm oil companies are allowed to operate in certain legally designated areas 1 SETAPAK, “Indirect Drivers”, 2016, http://programsetapak.org/key-issue/indirect-drivers/. Civil society organisations such as the Swandiri Institute argue concessions are granted to these industries without the knowledge or consent of the people living in affected areas. The lack of clear territorial definitions combined with a lack of acknowledgement of communal property rights has led to conflicts between businesses and local communities as well as accusations of “land grabbing”2P. Sabarini, “NGO Maps out Indigenous Community Territories”, The Jakarta Post, June 23, 2013, http://www.thejakartapost.com/news/2013/06/24/ngo-maps-out-indigenous-community-territories.html. Public institutions use maps and other geospatial data sources in order to administer these territories. The Indonesian government has a legal obligation to ensure land use is appropriate to the legally designated land type and the different interests of government, the private sector and local communities are balanced. However, information about land type, land usage and land ownership can often be incomplete, overlapping or contradictory, aggravating disputes and leading to inadequate social and environmental protections. In the past, civil society organisations have used participatory mapping to challenge official information about these lands. One positive outcome is the Ancestral Domain Registration Agency, which enables indigenous communities to register their ancestral territories. The Indonesian government has officially acknowledged the maps of these territories3TEBTEBBA, “Indonesian Government Accepts Ancestral Domain Maps”, November 14, 2012, http://www.tebtebba.org/index.php/content/238-indonesian-government-accepts-ancestral-domain-maps-making-indigenous-peoples-visible-within-the-nation-state . A group of researchers from Bonn University and Bremen University, Germany – including Irendra Radjawali, Martin Lukas, Julia, Oliver Pye and Michael Flitner – used unmanned aerial vehicles (drones) as an alternative approach to participatory mapping. The use of so-called “community drones” promised to deliver high-resolution images of territories, residential areas, farming, fruit tree forests and other long-term uses of the land that community members could easily gather and use for advocacy purposes4I. Radjawali and O. Pye, “Counter-Mapping Land Grabs with Community Drones in Indonesia. Conference: Land Grabbing, Conflict and Agrarian-Environmental Transformations: Perspectives from East and Southeast Asia, Chiang Mai, June 5-6, 2015. Their research was executed in Indonesia’s Tayan Hilir district, West Kalimantan province, together with villagers of Sejotang and Subah villages. The Swandiri Institute and the Dayak Customary Council represented the indigenous population in the area. Villagers were engaged to create their own cartographic material, to gather evidence of ecological damage and to represent their interests facing the expansion of oil palm plantations and mining companies. Specifically, they surveyed environmental damage caused by a bauxite mining company in the area close to Sejotang village. Drone-generated maps (or “counter-maps”) were used to provide evidence that the mining company was operating illegally (see picture below) and causing serious ecological damage to a lake nearby, but also to support the local community’s efforts to protect its ancestral lands and forest from illegal appropriations by companies. The data also revealed territorial conflicts between Sejotang village and another bordering village, which were competing about mining resources as a result of poorly defined village borders and a lack of transparency in spatial planning processes and politics in Indonesia. Drone footage showing illegal mining activities operating outside of the concession area: I. Radjawali and O. Pye, “Counter-Mapping Land Grabs with Community Drones in Indonesia. Conference: Land Grabbing, Conflict and Agrarian-Environmental Transformations: Perspectives from East and Southeast Asia, Chiang Mai, June 5-6, 2015. The research group used freely accessible information on the internet to build their first drone. According to the team, self-made drones are relatively cheap to acquire and the data is relatively easy to collect and use. After taking footage with a drone, it is possible to download images and videos directly onto a laptop in order to obtain an immediate snapshot of territories. 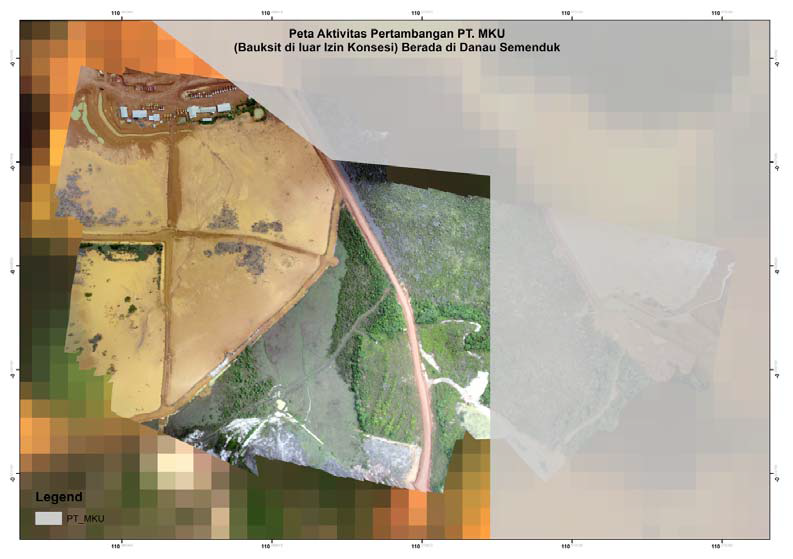 As the researchers document in one of their papers on the case study, this footage was used in village meetings and gave the communities a sense of empowerment5 I. Radjawali and O. Pye, “Counter-Mapping Land Grabs with Community Drones in Indonesia. Conference: Land Grabbing, Conflict and Agrarian-Environmental Transformations: Perspectives from East and Southeast Asia, Chiang Mai, June 5-6, 2015. The project involved 30 villagers in setting up the drone and electing a responsible person to conduct the mapping. Villagers were trained in workshops on the concept and practices of participatory mapping – including on the use and the operation of drones to support rapid, participatory counter-mapping initiatives to obtain high-quality spatial data about sites of interest. The initiative was funded by residents – such that each different part of the village contributed around $50 to the project. Partnering with the Swandiri Institute permitted the involvement of additional NGOs and single NGO activists working on advocacy of community land ownership. Community drone footage was used as legal evidence in a Constitutional Court trial in 2014 to demonstrate that mineral and coal mining companies weren’t complying with regulations. In May 2015, official representatives of Sejotang and Subah villages and members of the community drones project met with local parliament members. This resulted in political support for the initiative. Maps made by community drones in Tayan were successful in obtaining recognition for community-managed lands and customary community rights. The maps of ancestral domains acknowledged by the government in 2012 served as vital evidence for the community to show their land rights had been violated. Other local governments are now consulting with the initiative to clarify whether their spatial planning interferes with communal rights. Community drone footage was used as legal evidence in a Constitutional Court trial in 2014 to demonstrate that mineral and coal mining companies weren’t complying with regulations that prescribe the installation of smelters to refine raw materials before exporting them. The Constitutional Court trial is an important precedent to broaden the base of evidence on land disputes, demonstrating the potential of citizen data to challenge unfair and inadequate information collection practices by public institutions. These initiatives demonstrate how drone footage can be used as an advocacy tool to challenge the inadequacies of existing forms of data collection. Citizen-generated data from drones was used to advance a civil society agenda to change the classification and administration of territories. Civil society organisations are continuing to build on this work. The Swandiri Institute has extended its educational programmes and founded several so-called “drone schools” to engage a larger audience around this topic.